Child S, M, L; Adult S, M, L, XL. Foot Circumferences:5, 6, 7, 8.5, 9.75, 10.75 inches. Leg Lengths: 3.75, 5, 5, 5, 6.25, 7.5 inches. 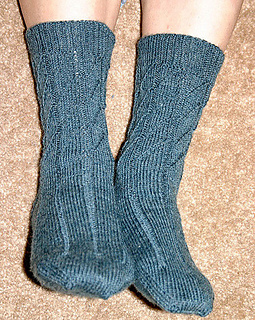 From the pattern description: Just in time for gift knitting season…here’s a crew sock that’s quick, simple, and handsome…in sizes for all your family and friends! Note: Everybody Wants Sox! 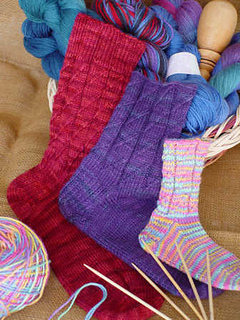 is the October pattern design in The Sock Calendar book along with 11 other monthly-themed sock patterns.